Coral reefs represent only 0,1% of the world’s ocean surface but contain 25% of marine biodiversity and more than 30% of species diversity of fish. 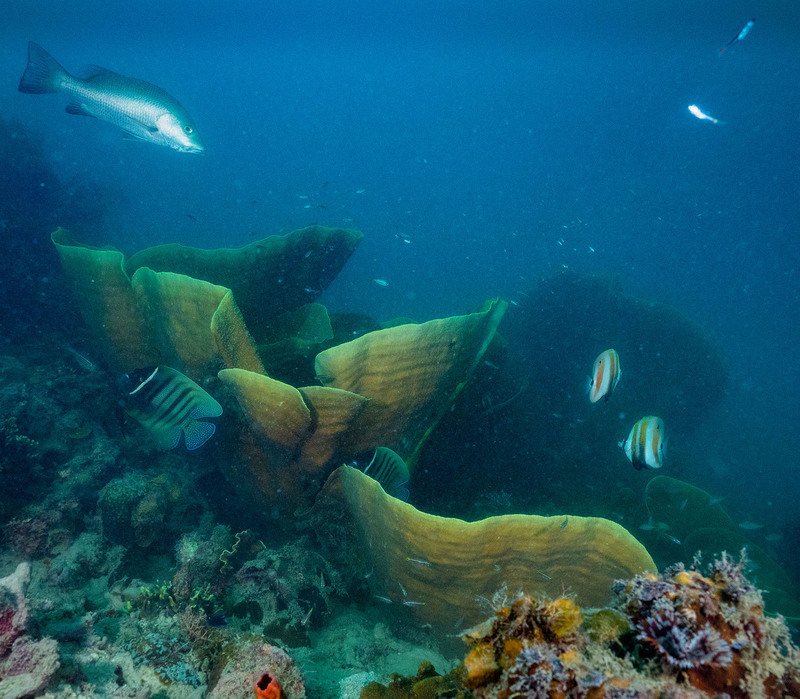 Indeed, coral constitute a safety place for many marine species, a nursery for juveniles of fish and invertebrates, and a food source for corallivore species, like parrotfishes. 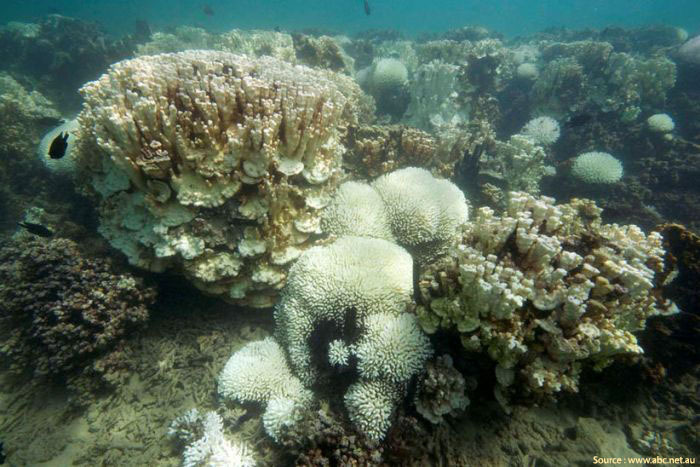 People who live on the coast, especially in Indo-Pacific, are highly dependent of coral reef. If the reef is healthy, it will contain numerous fishes. If not, few fishes will be present and the main food resource of these populations will be affected. Coral reefs are important for coastal protection by making a shield against strong storms and typhoons. 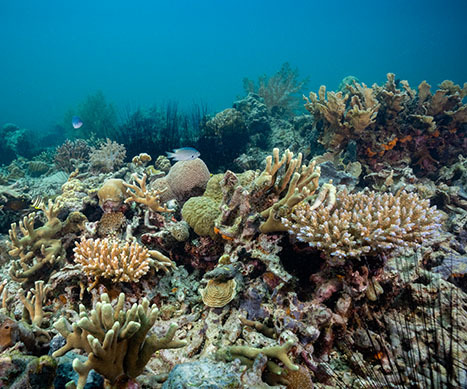 At the global scale, coral reefs are also very important because they take part of the ocean oxygen production, with their zooxanthellae symbiosis, which is about 50% of the oxygen atmosphere that we breath. Coral is part of family of anemones and jellyfish, so coral are animal. They are commonly divided in two kind: hard coral, Scleractinian, and soft coral. First, Scleractinian are form by polyps, living in a colony and secreting calcium carbonate skeleton. Consequently, hard coral is considered as a reef building organism, constitute coral reef and are at the origin of Atolls. 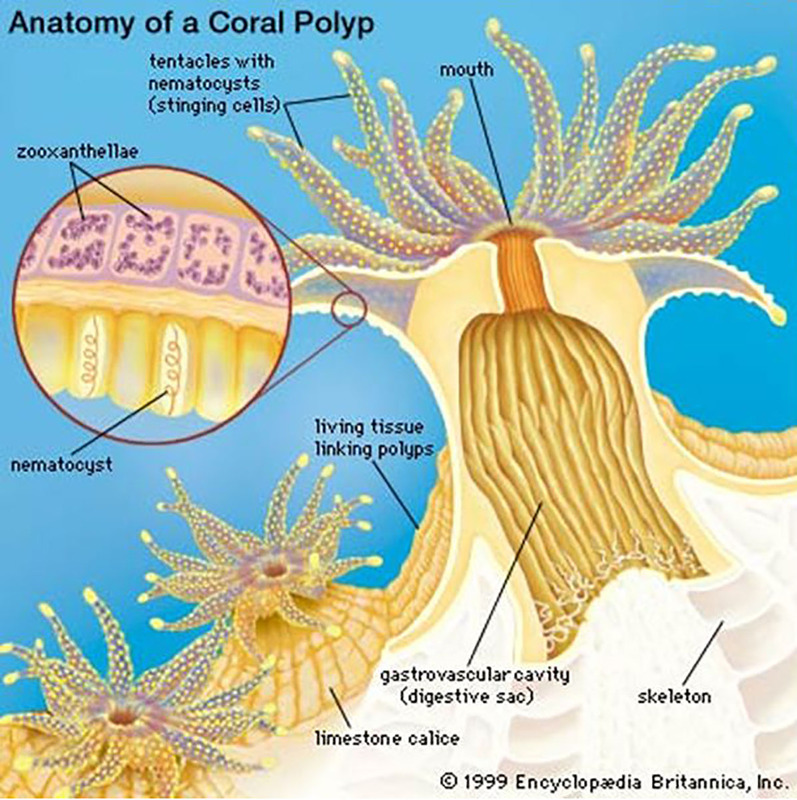 Coral = calcareous skeleton + polyps. 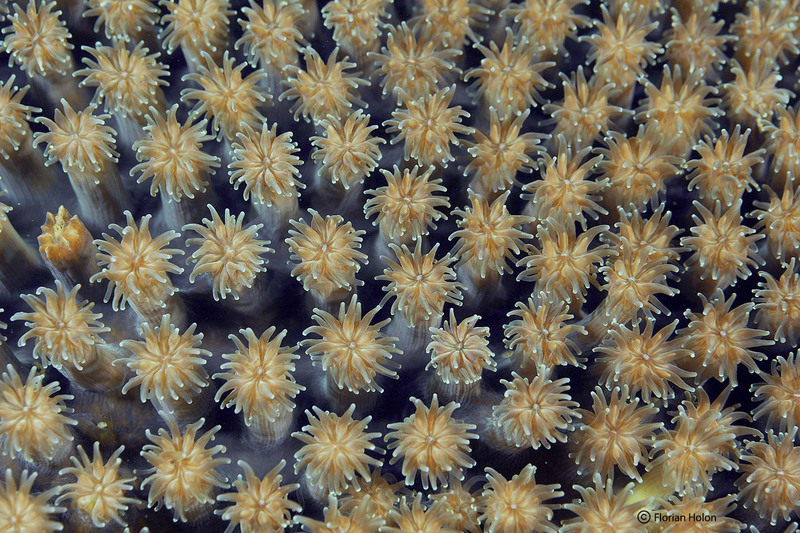 There is numerous kind of coral skeleton form and polyps, that define the different species. More than 800 different species have been identified all around the world. Depending the species, coral grows slowly, between 1 to 10 cm per year. Corals are 10% « carnivore » and 90% « vegetarian ». Corals live in symbiosis with microscopic algae, called Zooxanthellae. 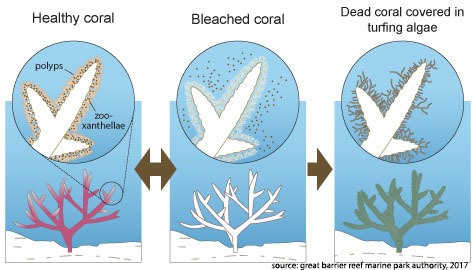 90% of the coral energy come from zooxanthellae via their photosynthesis process. In return, these algae are protected inside the polyps and can absorb some nutrients excreted by their host. Photosynthesis take place exclusively during the day, then during the night, polyps deploys their tentacles (where stinging cells, the cnidocysts, are located) for capture particles in the water. The Coral and its color. Normally, coral polyps have no color. The color of coral come from the density of zooxanthellae inside its tissues, which can vary between 0.5 and 5 million cells per m². So, a healthy coral is very colored. If coral is subject to stress, the symbiosis with the zooxanthellae will be broken, leaving the coral « white » (the color of the skeleton). Then, coral will lose most of its energy source, and can survive only for a short period. 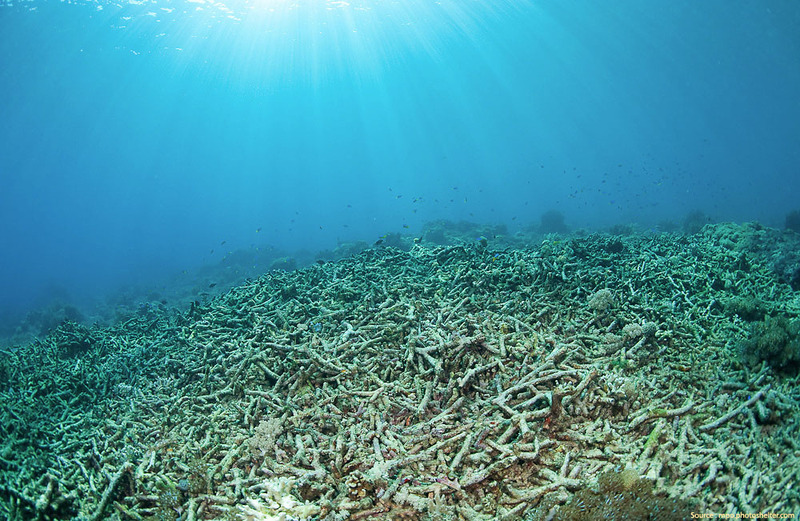 If environmental conditions still not favorable to the return of zooxanthellae, the coral die, and filamentous algae will take its place. Raise of water temperature, because of climate change. High irradiance ou Lack of light, because of water quality and water level change. Water acidification, induced by increase of atmospheric CO₂. Pollution by pesticide, herbicide and heavy metals, carried to the sea via land-runoff and rivers. Bacterial infections and or virus. Make a donation alone or with friends and Sulubaai Foundation will install your artificial reef composed by SRP for your coral fragments, geolocated and referenced to your name. With periodic reception of picture or video of your coral growth, you will be able to follow your involment every year. 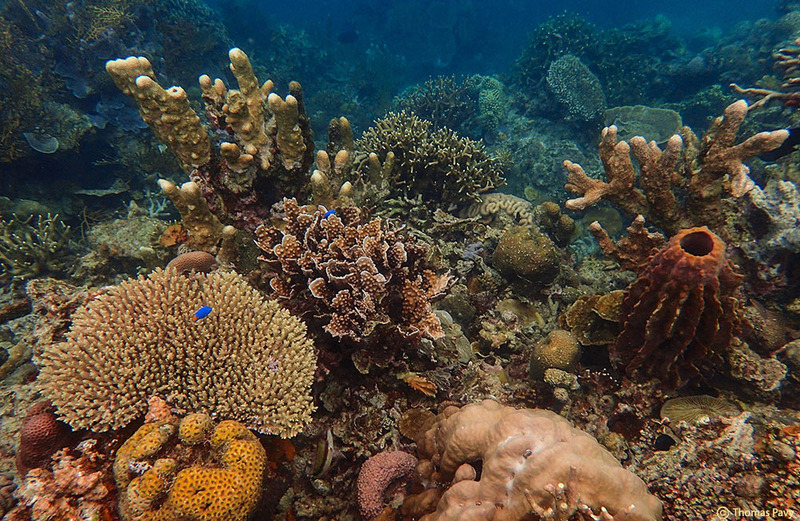 A survey (e.g coral growth, recruit %, density of fish and invertebrate population) will be done on your personal reef and will serve for our scientific partner in order to better understand coral reef resilience in Asia Pacific area. Thanks to your donation, you contribute to the restoration of coral reefs and their habitat function for many marine organisms, which have been destroyed by dynamite fishing, and then you help local population to protect their main food resource.